4K resolution has taken the limelight in many conversations about the future of image quality, for good reason: it delivers four times as much detail as 1080i HD television, with finer detail and better texture. However more recently high dynamic range, combined with wide color gamut and 10 bit sampling have come to the fore, either as additions to 4K or as a way of improving HD without the need for 4K. The human visual system (HVS) creates detail through a complex process that includes analysis of color differences and luminance differences. So, improving dynamic range and color gamut doesnt just make a picture look brighter or more colorful, it actually also improves resolution. One problem today with HDTV and also with some current 4K is that 8-bit sampling is used. With less than 256 steps to describe digital levels, unpleasant contour lines appear on sunsets, graduated colors, cloudscapes and other shaded images. Contouring can also occur when content changes slowly (as can happen with dissolves between graphics), as the contour lines move across the images with changes in the levels. The use of 10-bit sampled video with up to 4 times more steps - means there are more granularity between adjacent digital levels, making contour lines less of a possibility. Adding 10 bit to 4K (or even to todays HD services) offers potential benefits, however the extra precision of 10 bit really delivers when high dynamic range and wide color gamut are added. 10 bit high dynamic range and wide color gamut offers far more subtle and realistic images than either HD or the current generation of 4K and unlike 4K this combination of enhancements is not wholly dependent on large screen sizes and close viewing distances. 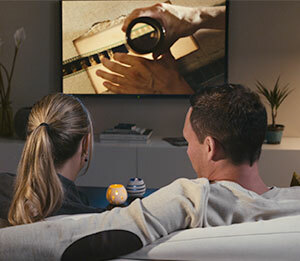 One question on 4K resolution has been that the distance from which the average consumer watches his or her television at home is not ideal for delivering the full effect of 4K. Even though 4K TV enables the use of larger TVs without softening or blurring, there is a complex relationship between peoples viewing distances and the capabilities of the human visual system, along with screen size and resolution. This means that smaller 4K TVs do not really give much consumer benefit at typical home viewing distances; on average only 4K TVs that measure 80 inches or more would provide the full effect in many homes. For this reason in particular, a number of question marks still hang over the head of 4K, and whether it deserves to be heralded as the future of more authentic picture quality. The debate is now shifting to enhancing either 4K or alternatively HD with 10 bit, high dynamic range and wide color gamut.